At this time of year, it can become challenging to maintain the safety and cleanliness of your workplace when the weather is seemingly conspiring against you! Commercial door mats provide businesses with a first line of defence in the battle to maintain the standards of your office by trapping dirt and moisture as people enter the building from the outside. Commercial door mats offer a simple and cost-effective solution to office floor care, but it’s one that is regularly overlooked. This is yet more surprising when you consider that most of the dirt found on an office floor is there as a result of it being walked in on the soles of peoples’ shoes. Once inside the building, this dirt and moisture then spreads, contributing to the 50% of workplace accidents that are attributed to tripping or slipping. 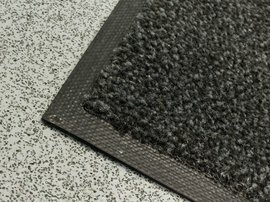 From a health and safety perspective, the quality of the door mat you choose is an important decision to be considered. It’s not all about price. Cheap door mats are prone to curling at the corners and sliding out of place presenting an even more dangerous trip hazard than not having them there at all. Cheaper mats are also less effective at absorbing moisture, which is their primary function. Mats that fail to keep floorspaces clean and dry can also result in increased office floor cleaning costs. Taking measures to keep your workplace clean and safe tells your employees, customers and visitors a lot about your business and the standard it holds itself to. Branded commercial entrance mats emblazoned with your company logo further adds to this image and the perception people will have of your office and your business. Custom door mats offer you something different to the norm, perfectly suited to your entrance areas. Other areas around the workplace may also benefit from mats, such as areas around water coolers and coffee machines. TWC Group offer businesses a fully managed lift and lay service. You simply let us know your requirements and we deliver the mats, put them in place, and replace them on a schedule to ensure they are always looking clean and smart, and are ready for use. The mats taken away are then professionally laundered ready for the next swap over. Speak to a member of the TWC Group team today to find out more about our entrance mat service.